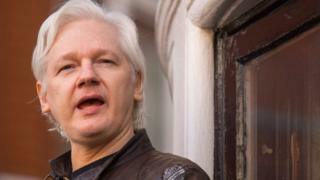 To explain his decision to break his bail conditions, Mr Assange argued that should he face the Swedish authorities, they would extradite him to the US. He fears he would be charged by US authorities for publishing classified documents on his Wikileaks website. But Judge Emma Arbuthnot said she did not find this fear "reasonable" - as any decision by Sweden to extradite Mr Assange to the US would cause a diplomatic crisis. Even if that decision was taken, she argued, Mr Assange would be able to argue against extradition by citing extraneous circumstances, fair trial concerns and poor conditions in US detention centres. In her ruling, she described Mr Assange as "a man who wants to impose his own terms on the course of justice, whether the course of justice is in this jurisdiction or Sweden". "He should have the courage to do the same." After the ruling, Mr Assange posted his reaction on Twitter, saying: "We are surprised. "Judge went well outside what the parties presented in court. This seems to have led to many factual errors in the judgment." A small group of supporters stood quietly outside the court, holding banners reading "Free Assange" and "Assange Safe Passage". Mr Assange's lawyer, Mark Summers, said his client was living in conditions "akin to imprisonment," adding that his "psychological health" had deteriorated and he was "in serious peril". The court heard that Mr Assange suffers from a bad tooth, a frozen shoulder and depression. The judge rejected these claims as reason to lift the warrant, saying: "Mr Assange's health problems could be much worse." She also rejected a UN report, cited by Mr Assange in his appeal, that said he is subject to arbitrary detention. She highlighted that he himself had negotiated the bail conditions he went on to break.